Murdoch, News Corp close The Daily: Why the world's first iPad-only paper should be its last. The Daily’s website was just an ad for the iPad app. The world’s first iPad-only newspaper may also be its last. To no one’s surprise, Rupert Murdoch’s News Corp. announced Monday that The Daily will cease publication on Dec. 15 after less than two years in existence. In a statement, the media baron eulogized The Daily as “a bold experiment.” That’s certainly one way to describe a news outlet whose content was available neither in print nor on the Web nor on most mobile devices. According to Pew Internet, one in four American adults owns a tablet. Of those, market research suggests that a little more than half own an iPad rather than an Android. And of those, my guess is that precious few saw good reason to prefer an iPad-exclusive news app to the iPad versions of much larger news organizations like the New York Times. Murdoch surmised correctly that online news consumption was beginning to move from the Web to mobile devices. But The Daily missed the whole point of digital publication, which is that you can reach a vast, worldwide audience across a wide array of platforms without having to design entirely separate products for each one. It’s one thing for general-interest magazines like Slate, Salon, Buzzfeed or the Huffington Post to do away with the huge costs and constraints of a print product. Once you’ve done that, narrowing your focus to a single device limits your audience far more sharply than it limits your expenses. 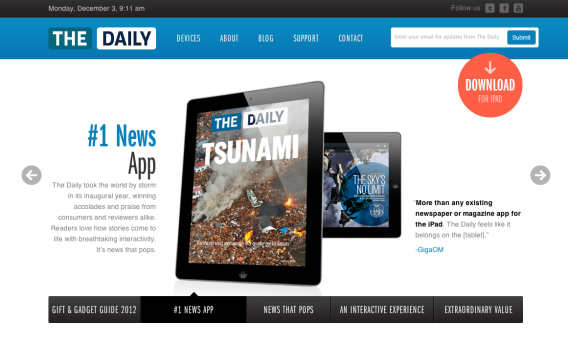 From its launch, The Daily was a bold experiment in digital publishing and an amazing vehicle for innovation. Unfortunately, our experience was that we could not find a large enough audience quickly enough to convince us the business model was sustainable in the long-term. Therefore we will take the very best of what we have learned at The Daily and apply it to all our properties. Under the editorial leadership of Editor-in-Chief Col Allan and the business and digital leadership of Jesse, I know The New York Post will continue to grow and become stronger on the web, on mobile, and not least, the paper itself. I want to thank all of the journalists, digital and business professionals for the hard work they put into The Daily. For what it’s worth, I’m told The Daily had some good journalists working for it. I don’t know. I’ve never read it.